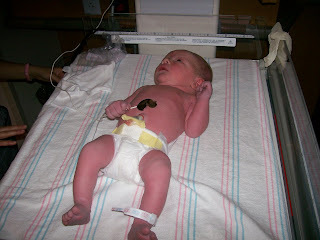 Brady James Garner was born on Friday, September 29 at 2:27 pm. 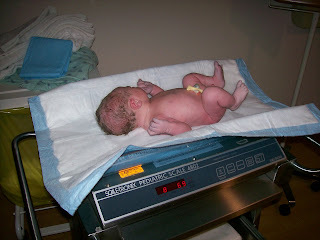 He weighed in at 8 pounds, 7 ounces, and was 20 1/2 inches long. 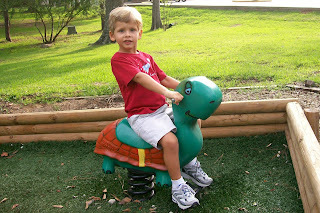 Below is a summary in pictures of Brady's birth day. 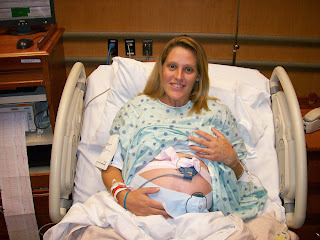 Hooked up to the fetal monitor, which monitored Brady's heart rate and my contractions. 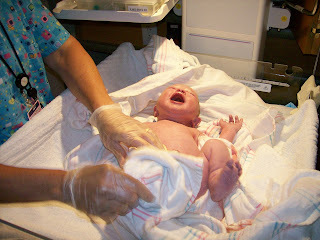 Brady being cleaned up after birth. 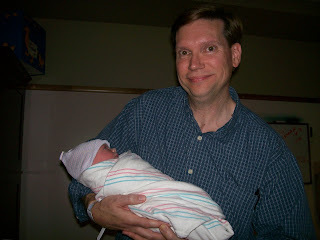 Weighing in at 8 pounds, 7 ounces (exactly the weight Randy had predicted). Having his first sponge bath. 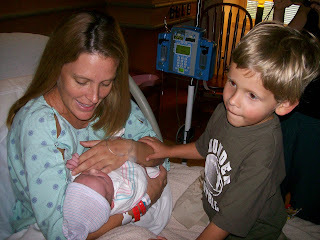 Dawson meeting his baby brother. 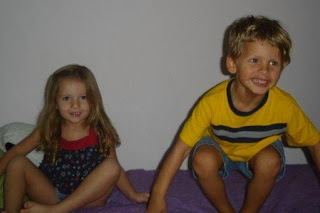 He was so sweet and gentle - what a great big brother! 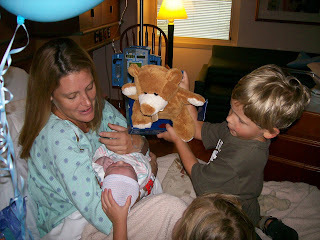 Dawson showing Brady the teddy bear that Angie and Kaelin had gotten him. 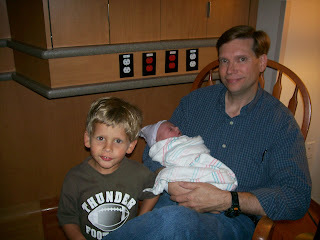 The boys - Daddy, Dawson, and Brady. 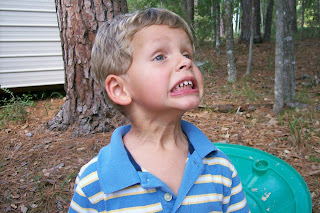 Dawson loves making silly faces and will frequently say, "Mom/Dad, I have a silly face to show you." 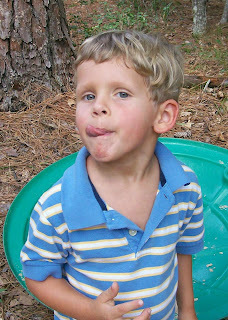 Here are a couple of silly faces he wanted to show me the other day. 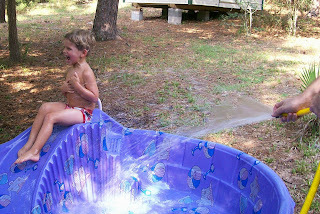 Squealing as Randy squirts him with very cold water. 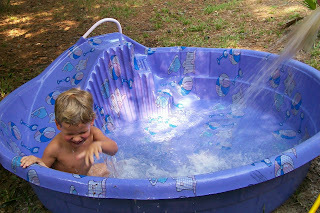 Making a big splash as he slides down into the water. 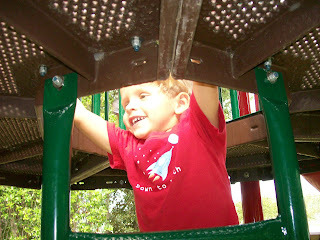 Dawson very happy to be playing in his sandbox. 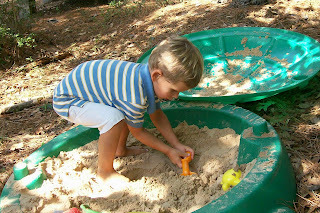 Scooping dirt in his shovel and transferring it from the sandbox base to the lid. 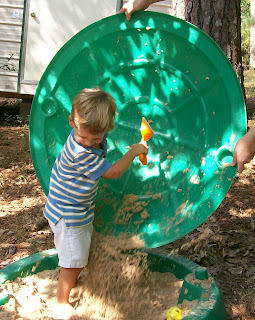 Randy dumping the sand back into the sandbox base and onto Dawson, something he found extremely delightful. 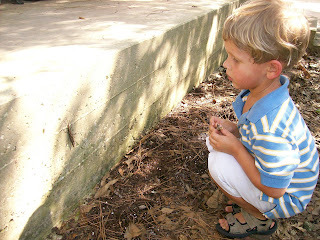 Dawson checking out the walking stick on our front porch. 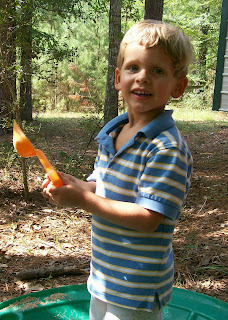 Interestingly, there was a small baby walking stick on the back of the larger walking stick. 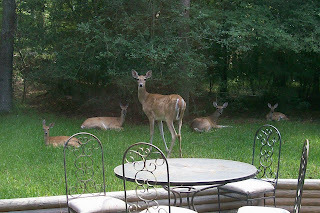 This is a regular sighting in our backyard. The deer pass through a few times a day, frequently stopping to rest in the grass or bushes. This is another benefit of living in such a beautiful place! Despite some encouraging reports from my doctor, we are still waiting on baby Brady to arrive. I started dilating a month ago, first at only 1 centimeter, then 3 centimeters, and as of last Tuesday 4 centimeters, but have yet to go into labor. I'm shocked to be walking around at 4 centimeters, very likely more by now, and not be in labor. My doctor was very optimistic that I would go into labor a week and a half ago when I was 3 centimeters. I was hopeful she was right, but have continued to be disappointed day after day. I am struggling with being patient as I wait for Brady to be born. I'm definitely ready to see him and hold him. Oh, and being hugely pregnant in August is just not any fun at all, which certainly contributes to my desire to have Brady come out already. :-) So hopefully the next post on our blog will be news of Brady's birth and pictures of the newest little member of our family. Dawson ready for a morning of swimming. 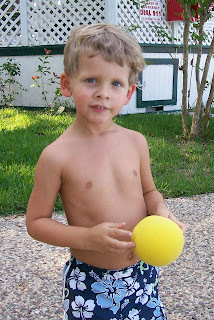 When his balls were thrown into the deep pool, he put on his floaties and swam out to rescue them. He liked rescuing them so much that he almost immediately threw them back into the deep pool so he could fetch them again. 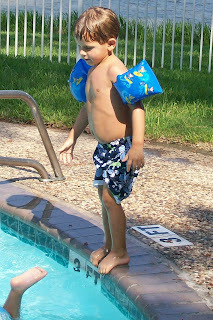 Poised to jump into the pool, definitely one of his favorite activities and something he does over and over again. 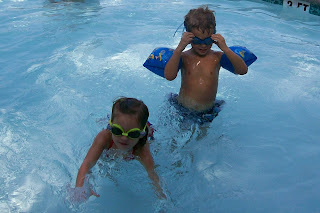 Kaelin and Dawson looking both cute and funny in goggles. 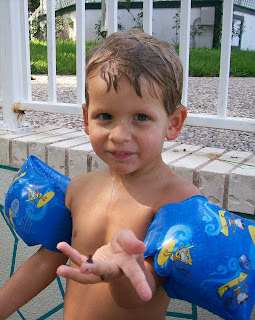 Showing me a tiny frog he caught at the pool. 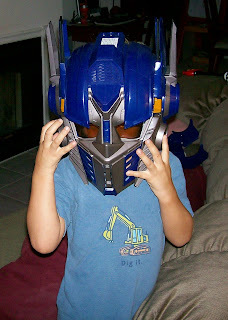 Dawson wearing his Optimus Prime (Transformers) mask. It's really neat because at the push of a button it changes his voice to make it sound more robotic. 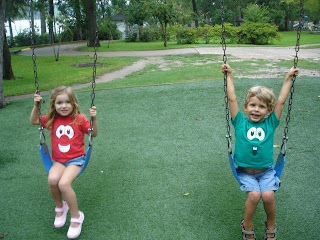 Kaelin and Dawson swinging at the park. 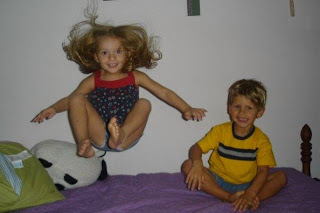 Kaelin and Dawson having a great time jumping on her bed. They really enjoyed jumping up and then crashing down on the bed. A great picture of Kaelin airborne. Dawson so happy to be playing with Kaelin. 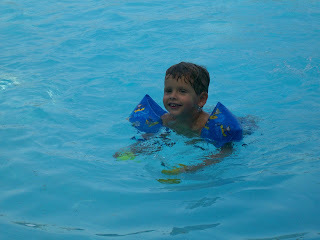 Dawson has really enjoyed watching Olympic diving. He'll even attempt to act out the diving he sees on television. 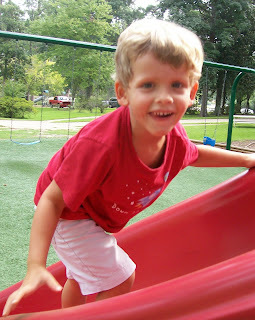 Below, he's standing backwards on his diving board (a.k.a. the couch) just like the diver on t.v. and after she jumped, he jumped down into his pool too (the pillows strewn all over the floor are the pool). 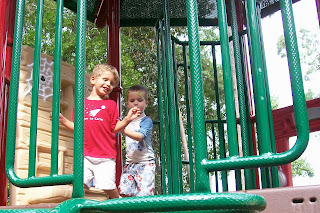 Climbing up the ladder into the fort. 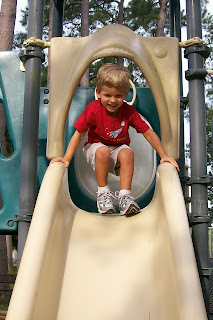 Running around in circles with Jay. 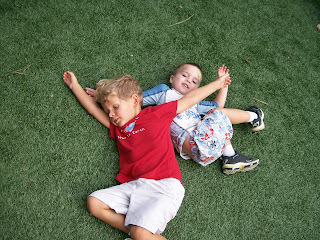 Dawson and Jay lying on the grass after sliding down the slide. 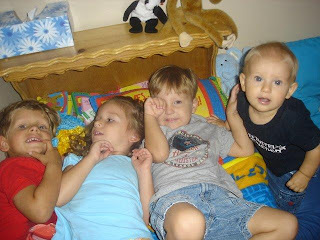 At a play date at Seth's house, the kids pretended it was nap time and all piled on Seth's bed. There's Dawson, Kaelin, Seth, and Cy. 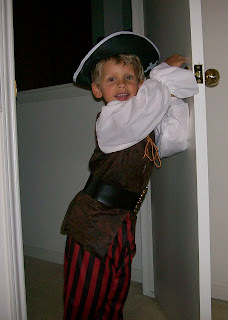 Looking adorable in his pirate costume. 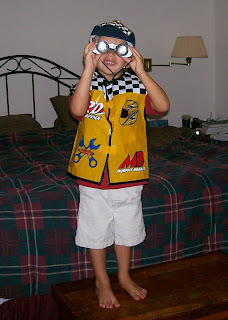 Checking things out with his binoculars. Having fun jumping on the bed. 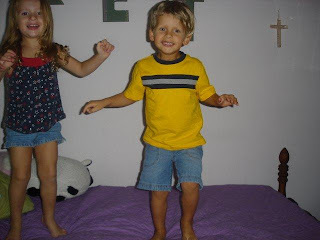 Looking so cute as he dances at Kaelin's. 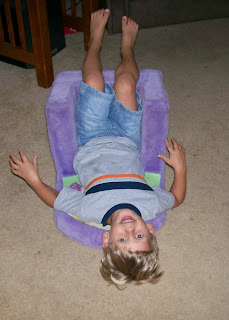 Upside down in Kaelin's chair. 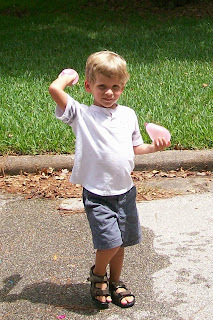 Dawson loves playing with water balloons. 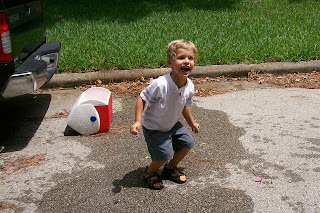 He likes throwing them at us and getting us all wet, and he is also delighted when we splash them on him and he gets soaked. 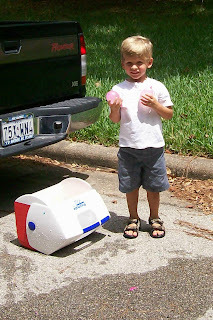 What good summer fun!! Dawson and I were doing his United States puzzle the other day and as he was saying the state names, he was also commenting about the various pictures on the state. 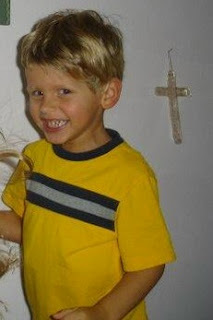 He noticed Nebraska had a picture of corn and I told him they had lots of corn crops in Nebraska. He also pointed out the car on the state of Michigan and I told him that they make a lot of cars in that state. When he picked up the Pennsylvania state he told me matter-of-factly, "They have lots of pencils in Pennsylvania." LOL!!! When he was petting Gertrude (our cat) and she wasn't exactly pleased about the petting, she batted her paw at him. 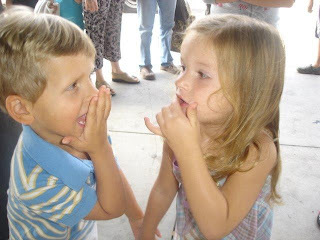 He jumped up, pointed his finger at her, and said, "Gertie, this is your warning!" 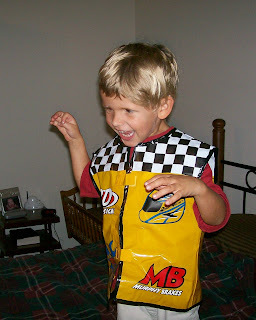 After playing quietly upstairs for a while, Dawson came downstairs looking like this. 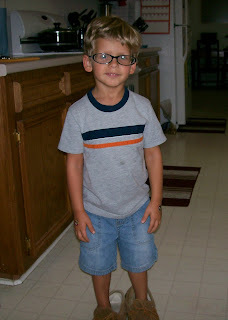 He had put on a pair of my old glasses and Randy's house shoes. 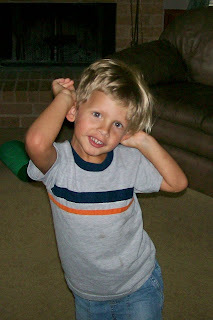 What a silly boy!!! 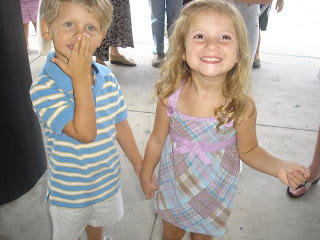 Last week, Angie and I took Kaelin and Dawson to see a movie at the big movie theatre in Conroe. 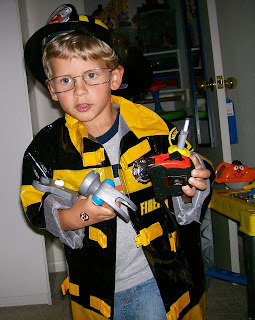 Dawson was most excited about getting popcorn at the theatre and, as usual, after about an hour into the movie he was ready to get out of there. The movie wasn't so great, but the movie theatre experience was fun. Two cuties waiting in line to get tickets to the movie. 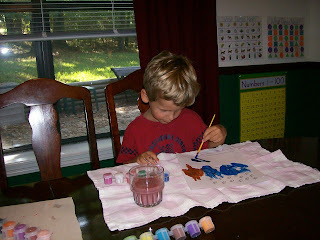 Concentrating on his beautiful artwork.